We clear blocked drains fast with the latest technology to ensure the sewers and stormwaters drains are cleared fast and efficiently. Our Hydro Jet Drain Cleaner can cut through the build up of grease as well as tree roots. The two nozzles and high density hose allows greater access to blockages than the electric eel machine. 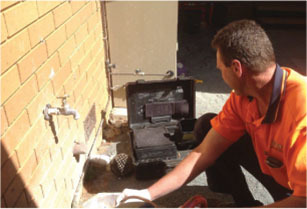 Our drain camera gives you a correct diagnosis of problems and therefore the most cost effective solution. Once drains are cleared the camera can identify the cause of the problem and if any other action needs to be taken to avoid a reoccurence. Are the drains in good repair? Many have a pest inspection before purchasing a home but have you thought of checking the sewer and stormwater drains. Damaged, cracked, broken sewer lines can require large excavations works and be expensive to repair. Call us today to arrange a pre-purchase drain inspection using our CCTV drain camera. 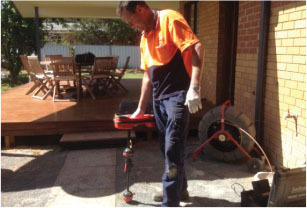 Our locating equipment can pinpoint problem areas when used in conjunction with the CCTV and hydro jet drain cleaner. This ensures no unnecessary digging which not only saves you money but also your precious garden.